Last Friday the Golden Nugget released their annual “Games of the Year” odds. As you might expect, several feature the Dawgs and, frankly, the odds paint an interesting picture (full list available here via ESPN). They cover every conference game on the schedule minus Vandy, Kentucky, and (wait for it) Auburn. 1. It’s really early. Like REALLLYY early. So don’t get too excited. Most of these will change. But still, you are reading this correctly in that Vegas basically has UGA at mostly even money to have a helluva season. 2. The Bama game as a pickem’ is the biggest surprise on this list. You could read that one of two ways: On the one hand, you could say that some Vegas oddsmakers don’t think UGA will have a problem at QB or at least that it won’t keep them from having a shot in games like the Bama game. On the other hand, you could read this as continuing mistrust of a Bama team that does seem to have lost a step (albeit just one single baby step) on the Saban monstrosities of yore. Either way, with Brice Ramsey about to play the biggest game of his life I’m really surprised Bama isn’t a -1 pick here. 3. Vegas is obviously really high on Tennessee as they should be. Tennessee could very easily live up to the hype and run away with the East this season. Going to Neyland the week after the Bama game sets the stage for a trap game to end all trap games. It might surprise you, however, to learn that the oddsmakers favor Alabama by 10 over Tennessee. Granted, the Vols do travel to Bama. 4. Second prize in the “best surprise” category probably goes to South Carolina line. The oddsmakers have UGA favored by 11 which I can only assume means they’ve never watched a UGA-South Carolina game in their entire lives. Either the ole ball coach has a real turd of a team on his hands or UGA is getting a lot of love when the line should probably be more economical. 5. Only favored by one at Tech because reasons. Tight end Garrett Walston has committed to UGA over my other school, the University of North Carolina. While most sites apparently only rank him as a three-star recruit, I have a couple of different insights to add here. 1) Being a member of the Inside Carolina message board, it was readily apparent that he was the top TE on the Heels’ list. With Eric Ebron just 13 months removed from being the tenth overall pick in the NFL Draft, Carolina has a legitimate claim as a good school for receiving tight ends. 2) Being a native of the 910 area code, of which Walston’s hometown of Wilmington, N.C. is, scouts don’t often get to the sparsely-populated area. Without doing research, the last 4-5* recruit from the large Southeastern Coastal Plain of N.C. was Xavier Nixon, a 5 star OT from Fayetteville. What I’m saying is that Walston is probably underrated by the recruiting services. I’d be surprised if he didn’t end up a 4-star. 3) I made a rare post defending Georgia’s commitment to throwing to the TE on IC. 4) Todd Gurley. Keith Marshall. JEBBLAZE. Garrett Walston. Georgia is planting some strong ‘crootin boots in North Cack. 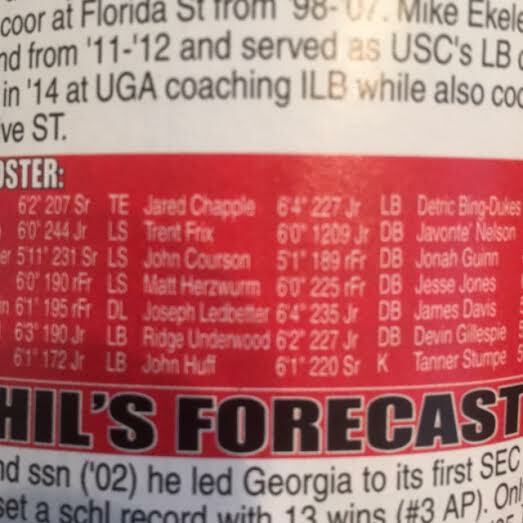 It has long been established that Phil Steele is the best in the college football preview magazine business. Two chock-full pages on every team in the country, predictions, advanced statistics, predictive models…it’s glorious. Well, with 352 pages of content and a limited amount of time for fact-checking, I guess even ole Phil can get one wrong every now and then. Georgia longsnapper Trent Frix (who, interestingly enough also had a brother and father serve in the same role) is listed on GeorgiaDogs.com at 6’0, 211. Steele’s magazine has him at a significantly higher weight. 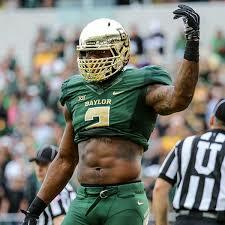 If he can still snap weighing 1209 lbs., sign me up for some #fatmanfootball. The best compliment for a special teamer is that you don’t know his name. If Frix hits the field at over half a ton, I’m afraid he will be anonymous no more. 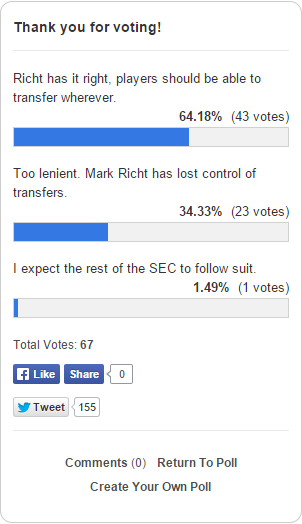 Richt Transfer Redux: THE READERS GOT IT RIGHT! On Friday, I posed a question to our loyal, patient (I got my Phil Steele magazine today, production officially ramps up tonight), and intelligent readers: Is Mark Richt too lenient on outgoing transfers? The results are in, and…by God, we actually agree that CMR is doing it right! I may be an idiot, but I couldn’t figure out how to see results without voting. Under those circumstances, it’s perfectly understandable as to why Richt would allow guys to carve out their paths as they so choose. Under the legal/school category, you have unfortunate Jonathan Taylor situations, and you have the ones like a Tray Matthews or Nick Marshall that could bite you on the field, but establish a little bit more credibility with parents. Given that, a little roster attrition (probably 20-30% per recruiting class) should be expected, and allows fans who follow recruiting to get all lathered up when the Dawgs line up another top 5 recruiting class. Anyway, I’m proud of y’all for agreeing with me and the rest of the DudeYouCrazy team, and I want to thank the solitary jokester/crazy person who expects the rest of the league to fall in line with Georgia.